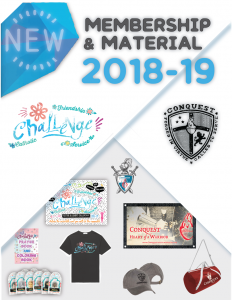 We are excited to announce the 2018-19 catalog is available with information about the new material and instructions of how to get ready for the upcoming Challenge club year . The Early Bird discount of $100 off the Annual Membership is also available through the month of June. You can download the complete Catalog and Info Flyer here and visit the Challenge renewal and registration site for details about how to get the Early Bird Discount. Series 2 Curriculum: Our Series 2 Curriculum is part of our new three year cycle. We launched series 1 last year, now we have Series 2 this year and Series 3 for 2019-20. We are still offering three grade levels in each series (5th/6th, 7th/ 8th and High School) plus we have incorporated the Junior programs into this 3 year curriculum series. New Team Leader Guidebooks have 5 weeks curriculum per book and 3 books per grade level. Each team leader kit now includes a new Advent 2018 and Lent 2019 team leader guidebook with 8 weeks of curriculum based off the Sunday liturgies. The Advent and Lent guidebook has Advent and Lent themed games and icebreakers. The Challenge Team Leader Guidebooks have new icebreakers added each week. Jr Program Curriculum: Challenge Jr Series 2 Curriculum is completely new and focusing on 5 new virtues, with games, crafts, saint stories, posters, custom stickers, charms and many more items to bring virtue and faith to life. The Challenge Jr Leader Kit has all of these items. Conquest Jr and Fr Son Curriculum has been improved and the new Leader Guides are in a more user friendly format. The curriculum and commitment cards now have custom virtue stickers to keep the boys motivated during each virtue campaign.